LED-backlit A typical CCFL LCD uses four backlight lamps. Using LED diodes considerably lowers the power consumption and reduces the CO2 emission into the environment making this LCD a true ECO-Friendly product. Advanced Contrast Ratio (ACR) Contrast Ratio is a measurement of the difference between the darkest black and the brightest white your monitor can display. Advanced Contrast Ratio is a feature that automatically adjusts contrast and brightness of the screen to assure perfect picture quality while watching films and playing games. 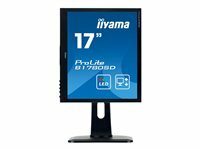 The 17’’ ProLite B1780SD designed for business usage is a LED-backlit monitor with Height Adjustability and Screen Rotation allowing you to set the perfect position of the screen ensuring ergonomic posture and optimal viewing comfort. The 5ms response time and high contrast make the B1780SD ideal for a wide range of business applications. sRGB and gamma correction functions permit even the finest nuances of colour to be set accurately. 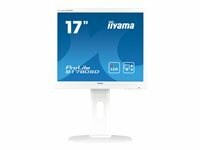 The ProLite B1780SD includes DVI and VGA connectivity and is available in white. HAS A height adjustable stand allows you to set the perfect position of the screen ensuring ergonomic posture and optimal viewing comfort which benefits not only your health but also productivity. LED-backlight A typical CCFL LCD uses four backlight lamps. Using LED diodes considerably lowers the power consumption and reduces the CO2 emission into the environment making this LCD a true ECO-friendly product. ACR Contrast ratio is a measurement of the difference between the darkest black and the brightest white your monitor can display. Advanced contrast ratio is a feature that automatically adjusts contrast and brightness of the screen to assure perfect picture quality while watching films and playing games. PIVOT Screen rotation means you can change the position of the screen from landscape into portrait. This feature can be very handy while working with long spreadsheets or texts. VESA VESA mount compliance means you can easily mount your monitor to a wall. 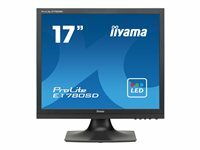 The 17" ProLite B1780SD designed for business usage is a LED-backlit monitor with height adjustability and screen rotation allowing you to set the perfect position of the screen ensuring ergonomic posture and optimal viewing comfort. The 5 ms response time and high contrast make the B1780SD ideal for a wide range of business applications. sRGB and gamma correction functions permit even the finest nuances of color to be set accurately. The ProLite B1780SD includes DVI and VGA connectivity.Get your PC off the floor with this bracket (VESA 100) MD BRPCV01 is a high quality bracket that allows a Mini PC or Thin Client to be mounted to the iiyama Height Adjustable stand.